1School of Nutrition and Dietetic, Faculty of Health Sciences, Universiti Sultan Zainal Abidin (UniSZA), Gong Badak Campus, 21300 Kuala Nerus, Terengganu, MALAYSIA. 2Faculty of Medicine, Universiti Sultan Zainal Abidin (UniSZA), Medical Campus, 20400 Kuala Terengganu, Terengganu, MALAYSIA. Objective: Gynura procumbens (Lour.) Merr is a well-known traditional herb and is widely used for traditional medicine by human. Previous clinical studies have shown the benefit effect of this leaves with inflammation, high blood pressure and others. This study aims to investigate the effect of methanol, ethanol, and ethyl acetate extracts of Gynura procumbens on U-87 cell line, human Glioblastoma multiforme cell line. Methods: In the present study, effect of methanol, ethanol and ethyl acetate extracts on U-87 cell line was determined by MTT-based anti-proliferative assay and any significant changes to the cells towards apoptotic changes was observed under a light microscope. 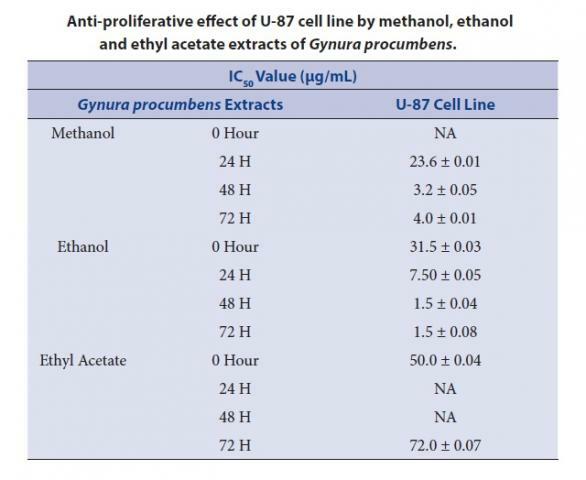 Results: The ethanol and methanol extracts of Gynura procumbens was found to have high anti-proliferative effect on U-87 cell line with IC50 less than 20μg/ml. By comparing IC50 value, ethanol and methanol extracts of Gynura procumbens had high potential for anti-proliferative effect on U- 87 cell line. Therefore, ethanol and methanol extracts can be a potential anti-proliferative effect on U-87 cell line. Conclusion: To the best of our knowledge, this is the first study of exploring the effect of Gynura procumbens extracts using three different polarity (methanol, ethanol, ethyl acetate) effect on U-87 cell line, Human Glioblastoma multiforme cells. Anti-proliferative effect of U-87 cell line by methanol, ethanol and ethyl acetate extracts of Gynura procumbens. Rohin MA, Jumli MN, Ridzwan N, Baig AA, Latif AZ, Hadi NA. Effect of Gynura procumbens Extracts on Anti-Proliferative Activity and its Associated Morphological Changes of Human Glioblastoma multiforme Cell Line (U-87). Pharmacognosy Journal. 2018;10(3):492-496.